Posted October 30, 2018 by Seán Kinane & filed under Labor, News and Public Affairs. The effects of climate change on Florida are not limited to sea-level rise, more intense hurricanes and disappearing coral reefs; a new report warns that as temperatures continue to surge, outdoor workers — like farmworkers and construction workers — are at increasing risk of severe health effects. The report, called “Unworkable. Dangerous Heat Puts Florida Workers at Risk,” was released Tuesday by the Farmworker Association of Florida and the nonprofit government watchdog Public Citizen. Jeannie Economos is the coordinator of the pesticide safety and environmental health project with the Farmworker Association of Florida, which partnered with Emory University for study of farmworkers. In a conference call with reporters Tuesday morning, she said heat is a public health threat for outdoor workers and it is getting worse with climate change. “The price we pay for our food exacts a price too high for people who plant and harvest it. 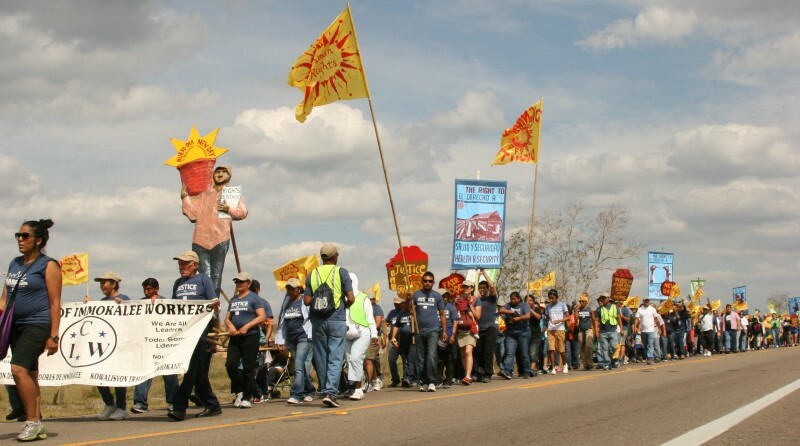 Farmworker men, women and children are increasingly subject to the ravages of climate change. It takes toll on their bodies as they work to feed our nation. Rising temperatures each year mean families working beneath the hot Florida sun, with our state’s high humidity are ever more at risk for the acute and chronic effects of heat exposure. “Dizziness, vomiting and cramps are only early symptoms that could portend heat stroke. Farmworkers often tell us that they work by the piece. So they don’t get paid by the hour, they get paid by how much they produce. If they stop to drink water, it means that they’re not able to harvest and produce as much and as quickly. So oftentimes they will not stop to drink water. They also don’t want to drink water because then they have to go to bathroom and that takes away time from their harvesting. “So this presents a really chronic problem that could lead to long-term chronic dehydration that could have an insidious effect and the eventual kidney failure, which means the farmworkers could be left with a life sentence of dialysis treatment. Another participant, Dr. Cheryl Holder, is the interim president of Florida Clinicians for Climate Action. “It’s important that we recognize that climate change is affecting our health now. And physicians and other clinicians play a very important role in preparing our patients and our community for the impact. “This report that you just highlighted shows the impact on workers. But not just workers. We know people who have allergies and asthma and lung disease; the prolonged allergy season, the increase in the pollutants in the air. “Just the increase in internal heat. Because as the workers are feeling the heat, those who are living hot areas with no air conditioning are also feeling the impact. We know that the most vulnerable among us, which are the children and the elderly and poor people who have ability to build that resilience and respond to the heat are impacted greatly. They’re calling for stronger federal worker protections and a reduction in greenhouse gas emissions. The most vulnerable populations are children, older people and low-income communities.